Behind the massive oak gate, a world of rich, early 17th century tranquillity is waiting for the visitor. There is the courtyard with its beautiful baroque portico and the white cobblestone pavement. Rubens’ house is on the left side, while his studio is on the right. In spite of overall alterations, the front of the impressive portico is genuine in all its detailing. The walls of the house are covered by the heavenly blue of a more than 50 years old wisteria. Entering through one of the three gates in the portico visitors will discover the garden and its many features. The central opening in the portico guides the view to the end of the garden, where the authentic garden pavilion in the central axe hosts a replica of the famous Hercules Farnese. On both sides of the central axe low yew hedges form squared parterres. Four ornamental wooden wickets give access to the flowerbeds. The garden displays a profusion of flowers and fruits, all known in the 17th century. Three more features have a specific charm: the beautiful wooden tunnel in renaissance style covered with roses, clematis and honeysuckle, the authentic, gardener’s lodge with its herb square and an 18th century round basin with a small orchard. Garden and buildings were severely altered during the last 400 years. Much of what is visible today is in fact a historic evocation from 1937-1946, based on archaeological studies of the buildings, on the interpretation of the iconographical documents and on contemporary choices. The Rubens House with the studio and garden dates back from the early 17th century and is one of Belgium’s the tourist highlights. But, in spite of what most visitors think, its actual appearance goes back to the late 1930s when the site was purchased by the municipality of Antwerp and interventions took place. The painter Peter Paul Rubens (1577 – 1640) build the house and studio and laid out the extensive garden from 1611 onwards near to the Hopland district, renown for its famous gardens. He built his house according to the prestigious Italian examples. It figured amongst the most magnificent palaces in the Netherlands. Rubens’ house and gardens were frequented by crowned heads, politicians, nobility and rich citizens. Although there is some written and iconographic information about the original garden, most of the layout and plants stay a mystery. The garden was more than an intricate architectural feature, it was the place to cultivate ornamental, edible and other useful plants. Rubens loved gardens and plants. There is also written proof that the garden at the Rubens House was not only ornamental. The most prestigious book he owned was Basilius Besler’s ‘Hortus Eystettensis’. The painting Allegory of Vertunmus and Pomona, better known as the Garden Walk (around 1630) shows Rubens and his second wife, Helena Fourment, in an ideal garden. But some of the garden features are so realistic that they might reflect the situation of the garden in Antwerp at that time: the garden pavilion, the fountain, the garden compartment and its wooden gate, the pergola, the pottery, the fruit and orange trees and the carnations. Only the multicoloured tulip compartment seems slightly overdone, even though the tulipomania dates from 1635-1637. Although already listed long before, the Royal Commission for Monuments from 1887 on asked for the purchase of the Rubens House by the government. After long negotiations and expropriation the purchase became a fact in August 1937. From 1938 on, documentary photos were made from the house, the studio and the garden site as well as from the 17th century architectural remains, including a photo of a garden excavation. Photos of the garden show a dividing garden wall, stables in the back and a tobacco storehouse. It was clear at that time that the reconstruction of “the real” Rubens’ Garden was impossible by lack of information. With the agreement from the Royal Commission for Monuments and Sites, town planner and architect Emile van Averbeke and landscape architect Georges Wachtelaer, did create a 20th century evocation of the garden, based on contemporary garden books by Hans Vredeman de Vries and Johan Van der Groen, herbal books by Dodoneus, Lobelius and Vande Passe, period paintings and drawings by Rubens and his pupils. Photos of the finished garden in 1946 reveal four yew hedged grass compartments and surrounding flower beds. The garden had much more affinities with the Belgian arts and crafts movement than with the late renaissance garden. The Italian poplars around the garden helped to mask the surrounding buildings but also added to the alienation. It is in the restored garden pavilion, in the construction and fine detailing of the wooden garden gates and in the beautifully proportioned pergola that the architectural skills and the able craftsmanship of Van Averbeke and his companion Victor Blommaert flourished. 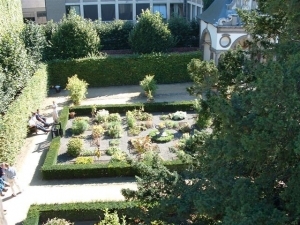 Less than 10 years later, the head of staff of the Rubens House declared to a local newspaper that the garden had been a meticulous reconstruction. Nobody had ears for the fierce protest of the creative team against this falsification of the facts. In 1976 much of the original planting was replaced with fashionable annual plants and modern perennials. By the 80s the garden had become almost sterile due to reduced maintenance. The garden was crying for action again. 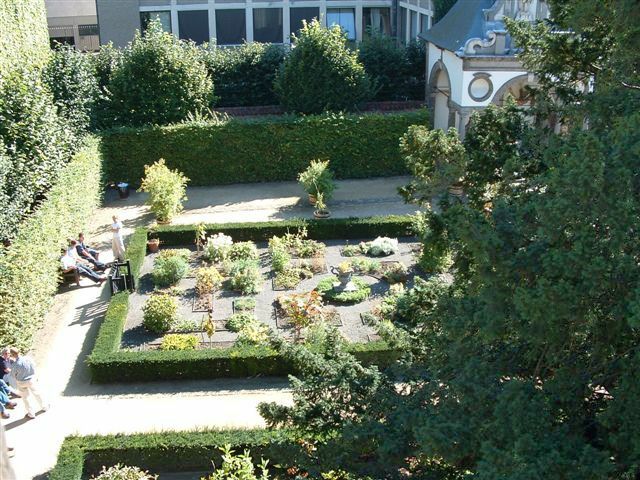 In 1993 the garden was finally upgraded and the result was rewarded by the European Council. The work began with the ‘reconstruction’ of the pottery as shown in the Garden Walk. Special attention was given to the form, size, colour, texture and the finishing of the tubs. By the end of 1992 the Italian poplars with their invasive roots were replaced by pollarded lime trees. Prior to the works, a pedological study by the city’s archaeological services didn’t produce useful information. In a second stage of the enhancement the grass in the compartments was replaced by flowerbeds inspired by the Vredeman de Vries famous Hortorum series (1583). Consequently the surrounding flowerbeds disappeared. An extensive list of plants taken from the annotated and in 1987 published Antoni Gaymans (1630-1680) herbarium in Leiden, was introduced. Today the Rubens Garden is a good example for up-to-date management and maintenance of historic gardens: In 2001 for the first time ever cultivated plants that were fenotypically correct for the Rubens period were planted: the carnation (Dianthus plumarius) ‘Rubens Palet’ and 10 historic selections of the Andes potato (Solanum tuberosum ssp. andygena), an ornamental potato introduced in Europe by the end of the 16th century. The effects have been diverse. Today the woodwork in the garden needs extensive restoration. After 60 years the oak is rotting at the base of the columns and at the joints of the arches. 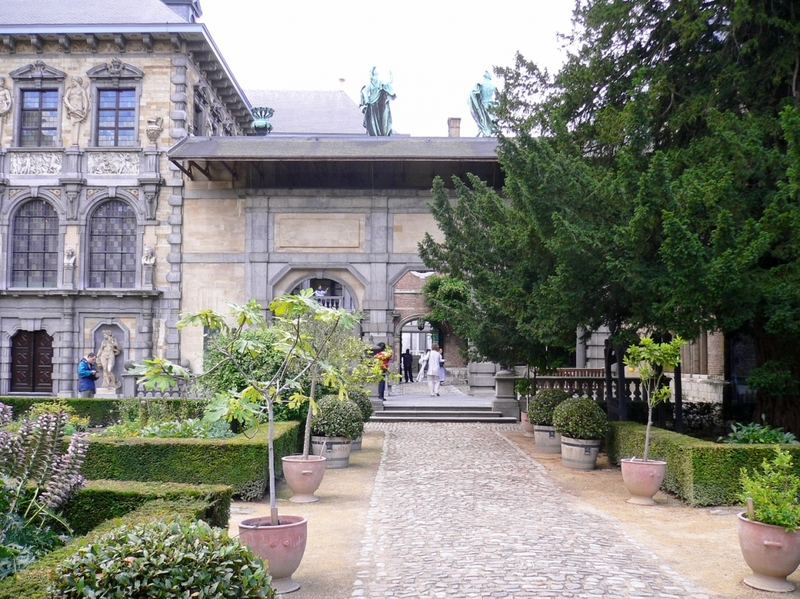 The successful restoration, careful maintenance and the charm of the garden attract about 250.000 visitors per year and make the Rubens garden at the Rubens House one of the highlights in the city of Antwerp. Accessibility: Garden fully accessible for people with limited mobility. Information on the entire museum is available in the shop. No specific garden guide.